Ask More. Know More. Share More. Create Compelling Conversations. The "Your Life" section includes 13 topics that people love to talk about in daily life. Intermediate and advanced ESL/EFL students, and native English speakers can use these conversation lessons. 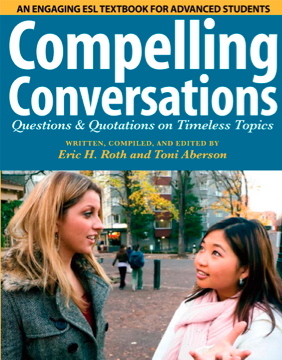 "Compelling Conversations: Questions and Quotations on Timeless Topics" (Chimayo Press) is an innovative English as a Second Language (ESL) textbook that helps advanced English language learners develop conversation skills and improve fluency by sharing experiences, reflecting on their lives, and discussing proverbs and quotations. Can also be used to teach English abroad in English as a Foreign Language classes (EFL). The "Your Life" section includes 13 topics that people love to talk about in daily life. Intermediate, advanced, and native speakers will all enjoy this material. Chapter titles are: 1. Getting Started 2. Going Beyond Hello 3. Being Home 4. Describing Family Ties 5. Eating and Drinking 6. Exploring Daily Habits 7. Being Yourself 8. Staying Healthy 9. Parenting 10. Making and Keeping Friends 11. Loving Dogs and Pets 12. Cats and More Cats. 13. Pet Peeves The complete "Compelling Conversations" book includes 45 thematic chapters, over 1400 questions 500 vocabulary words, 250 proverbs and American idioms, and 500 quotations. Designed for both adult education and intensive English language students, the conversations deepen critical thinking skills and speaking skills essential to success in community college and university programs. Compelling Conversations has been used in classrooms in over 50 countries, recommended by English Teaching Professional magazine, and enjoyed by thousands of English students.